Ok taking this from the original forums i thought i'd continue this. The idea is simple we design our own period of war over several years involving various factions etc. This is to be period of time that any fanfic authors can use for their fluff. We are looking at the history of the event, those involved, the length of time, the famous battles and possibly the end. That an imperial sector undergoes a religeous schism for whatever reason which results in an eternal struggle within the sector. As the Ecclesiarchy get involved to stop the war so does a local Governor who starts using vast amounts of Penal Legion soldiers for war. Eventually the Imperium launch a full crusade and there are many factions on both sides such as Guardsmen, Sisters of Battle and Astartes. We also discussed the possibility that our rebel forces become Chaos and that the Tau Empire might have some involvement. Sounds interesting. Do you mean something like the badab war. Are we beginning again from scratch? we come up with a conflict and some sort of background for it, is that what you're saying? We could start from Scratch or continue where we left off. It depends what people want, if they have better ideas then what we initially put i see no reason why we cannot change it, providing no one complains of course. Well given that interest seemed to wane and the flow of ideas dried up, I'd say we see who's up for it and just start over. No reason we couldn't all flit back to the old Bolthole and read what we'd already done and cannibalise anything we want to keep. Would it be possible to get involved with this? Sounds like a really interesting project, and I like the ideas you guys have had so far! just a quick question. how exactly do we do this? @ Obscura Boy, anyone can join this project as its for everyone to get involved in. @ Commander Shadow. Its simple really there are several key things we need for this. 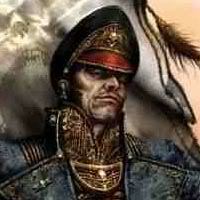 First is to who is involved in this war, its always the Imperium but who are they fighting (my advice is to steer away from loads of factions), next is how did this war come about (what led to it, is anyone to blame, etc), then you get the war itself (so those fighting, the heroes, villains and the famous battles) and finally there is the end game (no we could say this war is still continuing or that one faction loses, how many years does it all take). If you have any ideas on any of these questions just raise them here, put what you would like to see and everyone will discuss it, with the original one we did most of the ideas stemmed from Phoenix, Schafer and Raven, but that was the old one and we can as stated by Raz start from scratch, so lets here what you want and we'll see where we can go from their. Personally, I think we should all read what was done on the old board and put forward those ideas that we like from it, but generally start again. We can PM those who were in it at the beginning and ask if the wish to participate or not (in a nice way, no pressure or anything). We didn't really get much going, so it doesn't make sense to carry on from there with different people. If everyone says their thoughts, ideas etc we can see what concensus we have between those participating, what we agree on and don't and work out where to go from. It may be an idea to decide where this world or sector is on the map to help tie it into the existing lore. Personally I'm a fan of the big open space in the Ultima Segmentum, because its technically expansive but also leaves it feasible to have practically anything come our way should we want it to. Last edited by Raziel4707 on Wed Mar 23, 2011 11:45 am, edited 1 time in total. I think it would also be cool to outline the basis for the main or capital world, its population, its industry, basic appearance, major geographic features, standing military forces etc, obviously with lots of detail about the military and government. Good to start with a picture from before the poo hits the fan, as it were, so we can reasonably extrapolate what happens afterwards. Would also make sense to design our antagonists too, who they are, what they want, if anything. See what you make of that idea, chaps. In the meantime, I'll read some more of the old thread. I'd be completely open to participate in this. The religious schism sounds like a great idea. Not to sure about the Tau though. From what i've read of 40k they are pretty Far on the edge of the Eastern Fringe, so it would depend on how far east the system is. Wherever we like! In a way, the further east we have it the better. Extreme distance from Terra would certainly aid in the gaining of support for a religious schism of any sort, particularly in an area where xenos are more abundant. We'd just have to make it a respectable distant from anywhere like Ultramar or Honourum, as there's no way the astartes would permit any form of apostasy in their back garden without going all killy on it. Eastern fringe somewhere should suit us fairly well. Far East it is then. Should we come up with names and stuff? There were a good few names raised on the old site for various places. I was thinking that with the distance you could easily have perhaps the local government making perhaps a few minor alterations to creed to make trade with Xenos more acceptable, especially if we go with the Tau angle on things. After all those little grey skinned guys are a sly bunch and once their water caste are going backwards and forwards from worlds then the region is doomed. With our capital world we could go for a simple Hive World but as we might keep the schism we could have a cardinal world. Now with the Hive World i suppose its main export would be man power, where as the Cardinal World would instead perhaps just be the religeous centre of an entire sector and thus influence priests etc. I am on Holiday until Tuesday so i am unlikely to be on much, if i can i will post as often as possible. How about a simple industrial worlds that has hives but also a strong eclessiarchy presence? If its on the Eastern Fringe it would be less developed than interior worlds but still need the religious mark of Imperial Authority.